Based on our genetic testing and genetic counseling experience, we’d like to answer some of the most frequently asked questions on hereditary hearing loss. For the complete disease card on nonsyndromic deafness and hearing loss you can click here. Neither my partner nor me are affected by hearing loss. None of our relatives is affected either. Are we still at risk of having babies affected by hearing loss? Yes. There are several forms of genetically determined hearing loss, both syndromic (hearing loss is found together with malformation of the outer ear or other organs and tissues) and nonsyndromic. Most cases of nonsyndromic congenital hearing loss show autosomal recessive transmission. In autosomal recessive transmission affected individuals are born from affected or unaffected parents. The frequency of healthy carriers of the most common form of nonsyndromic genetic hearing loss (DFNB1, caused by mutations in the GJB2 gene) is about 1 in 33. Therefore, in the general population, the likelihood that both members of a couple are healthy carriers of DFNB1 is about 1 in 1,000. Besides DFNB1, several other genetic subtypes of autosomal recessive hearing loss have been described. Moreover, due to incomplete penetrance, even autosomal dominant and mitochondrial forms of hereditary hearing loss may be clinically silent in one parent, but become symptomatic in the offspring. How can we quantify the reproductive risk for hereditary hearing loss? Autosomal recessive hearing loss: if both parents are healthy carriers of the same genetic subtype (e.g. DFNB1), they have a 25% chance of having a deaf child (at each pregnancy). Autosomal dominant hearing loss: if one parent has an autosomal dominant form (symptomatic or asymptomatic), he/she has a 50% chance of transmitting the disease-causing mutation to the offspring (at each pregnancy). Whether the offsrping will be symptomatic or asymptomatic depends on the gene, the type of mutation and the level of penetrance observed for that particular genetic subtype. Mitochondrial hearing loss: mitochondrial disorders can be transmitted just by women, because spermatozoa contain no mitochondria at all. An healthy carrier woman may conceive affected males. The probability that this happens depends on the mutational load (e.g. the number of mutated mitochondrial DNA molecules transmitted by the mother to the child). X-linked hearing loss: all sons of an affected father will be healthy non-carriers whether all daughters will be healthy carriers or mildly affected girls. A healthy carrier woman, together with a not affected and not carrier partner, has a 25% chance of having not affected and not carrier daughters, 25% chance of having healthy carrier daugthers, 25% chance of having affected sons and 25% chance of having not affected and not carrier sons. In the general population, the a priori risk of conceiving deaf children in unaffected couples with no family history is about 1 in 1,000 (0.1%). What can I do to eliminate or decrease my reproductive risk for hereditary hearing loss? It is impossible to reduce the risk to zero. Hereditary hearing loss is one of the most clinically and genetically heterogeneous conditions. 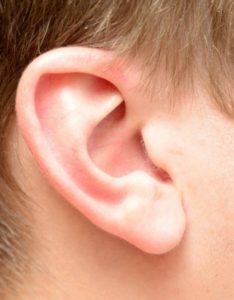 Some authors think that mutations causing some sort of hearing loss (either syndromic or nonsyndromic) may arise in at least 1% of all human genes. It is possible to do a screening for the most frequent mutations, like for instance the ones of the GJB2 gene (which encodes for a protein called connexin 26). Next generation sequencing panels, possibly based on exome or genome sequencing, enable the screening for mutations in many additional genes. However, even after sequencing several genes, there’s still he chance that the subject is carrier of a disease-causing mutation, which cannot be identified a priori. Such a residual risk is due to the following issues: (1) presence of a mutation which is not detectable by sequencing (e.g. a CNV – Copy Number Variation –: it is estimated that at least 15% of deafness patients harbor a CNV); (2) presence of variants of unknown significance (VUS): due to their molecular properties, some mutations remain of unknown significance when they are identified in unaffected subjects. As such, these mutations cannot be reported as pathogenic, although they might actually be; (3) presence of a mutation in an unknown gene. Is it then worth doing a preconceptional screening for hearing loss? The answer to this question is not an easy one. Given, as said above, that the risk of being carriers can be reduced but not eliminated, it remains a personal choice. It is also worth to remember that some preconceptional panels include the screening for additional genetic disorders, which may add appeal to the test, especially in case of positive family history. Which kind of preconceptional screening are available for hearing loss? A basic, widely available preconceptional screening for hereditary hearing loss consists in the scanning of the most common GJB2 mutations. Fewer labs offer entire GJB2 gene sequencing. Breda Genetics offers a complete panel, which includes GJB2, the mitochondrial genes and all other nuclear genes known to date to be associated to nonsyndromic autosomal recessive, autosomal dominant or X-linked hereditary hearing loss for a total of 102 genes. Since the panel is based on exome sequencing, it is also possible to screen other genetic disorders. If there’s no family history for genetic deafness, the analysis will report mutations that have been previously reported and are a recognized cause of the disorder or variants that are previously unreported but are of the type which is expected to cause the disorder (e.g. nonsense mutations), whereas VUS won’t be screened for nor reported. To learn more about our solutions for deafness testing, you can read our complete clinical card: deafness and hereditary hearing loss, nonsyndromic. What’s the difference between deafness and hearing loss? “Hearing impairment” and “hearing loss” are often used interchangeably by healthcare professionals to refer generically to a decrease in hearing capabilities, whereas “deafness” is a term that usually implies hearing thresholds in the severe-to-profound range by audiometry. Is hearing loss stable or progressive? There are clinically stable and clinically progressive forms. Autosomal recessive hearing loss is usually more severe, but stable. Autosomal dominant hearing loss may be milder, but it’s usually progressive. Exceptions exist in both groups. Can prenatal diagnosis improve the outcome? As for most clinical conditions, either genetic or non-genetic, early diagnosis is very important to take actions on time. Especially in severe to profound hearing loss, cochlear implants can significantly improve hearing function. Before proceeding to the cochlear implant, the diagnosis must be clinically and, if possible, genetically confirmed. Is it possible to diagnose hearing loss by fetal ultrasound? Hearing loss diagnosis by fetal ultrasound examination is not possible. Some forms of syndromic hearing loss might be detectable because of associated malformations which might be visible on ultrasound at variable stages of pregnancy. Is it possible to correct the genetic defect in order to restore the hearing function? No, genetic therapy is currently unavailable for hereditary hearing loss. Therefore it is not possible to correct directly the genetic defect, neither prenatally nor postnatally. For severe to profound hearing loss good outcomes can be obtained by the use of cochlear implants. Posted in Academia, Last Update, Medical Genetics.